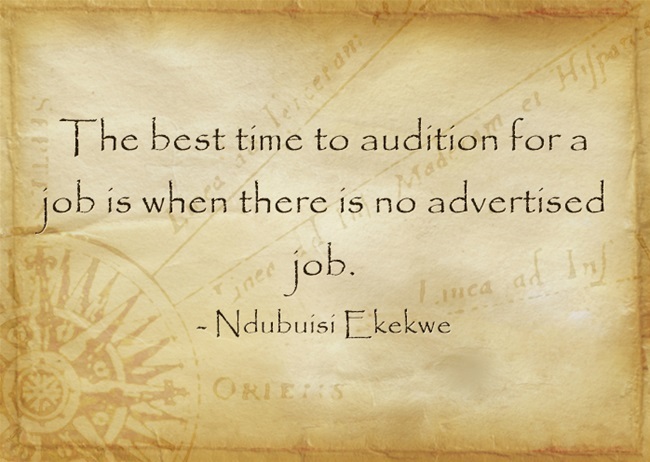 I say this to many young people: the best time to get a job is when there is no advertised job. And to aspiring consulting entrepreneurs: the best time to get a contract is when there is no available contract. In this digital age, it should not be hard for people to know what you can do well. Unless your works are working for you when you are sleeping, you cannot scale any mission. One great article can unlock huge opportunities for you, beyond whatever you can imagine. Yes, a computer code in a code repository will do more than a shiny resume which has been reviewed by HR experts. But will you take time to do those? I shared an experience here of an encounter with two brilliant boys in Lagos. After writing about them, I am sure more than 30 people must have offered them jobs, including myself. They have no college degrees. What did we see? Their codes (yes, outputs) and not any paper or CV. Quickly, I marshaled to track both in Nigeria and within minutes, I spoke with Moses. I offered jobs to start on Monday but Moses “smiled”. I offered to fund your ideas immediately, Moses “smiled”. Because that happened, your story becomes more exciting: jobs and money serve great people! You both are amazing. Think about this stage in an interview. Hiring Manager: You will be working on statistical modeling. We have data we need to understand better. We are looking for people with basic understanding of regression, series and calculus. While researching you, we saw this article you wrote on regression. Can you tell me more about this section? We decided to invite you because of this article. Applicant: Sir, may I have a chalk since I can see a blackboard here. I can explain that paper. That was my college final year research work; I simply summarized it in the blog. In short, during my NYSC, I have updated the model with more insights I picked up from Coursera. So, the statistical model is now better. I will send a link to an updated article later. But I will begin with the paper you have and then extend to the state of the art at the moment. Simply, if you are a developer, the best resume now is your GitHub account. Period! I challenge our young people to understand the new nature of work. ---Visit our Store for my books, cases, notes, etc. Now, enjoy our consolidated subscription for all contents (past, present and future). -- We offer Advisory Services (tech, strategy & Africa). Amazing piece… Always inspiring.. There are alot we need to learn for the coming economic era in Africa.